© Posted on January 2, 2018, by Michael E. Newton. 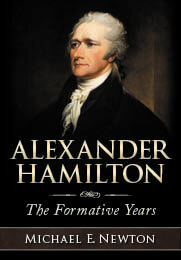 In his award-winning, best-selling Hamilton biography, Ron Chernow presents a captivating narrative of how James Hamilton, Alexander Hamilton’s father, apprenticed for a businessman in Glasgow, moved to St. Kitts as a merchant, failed in this career, and consequently found other employment. Although Chernow’s is probably the best and most complete discussion of the topic to date, there is at least one error in his narrative and a number of omitted details. 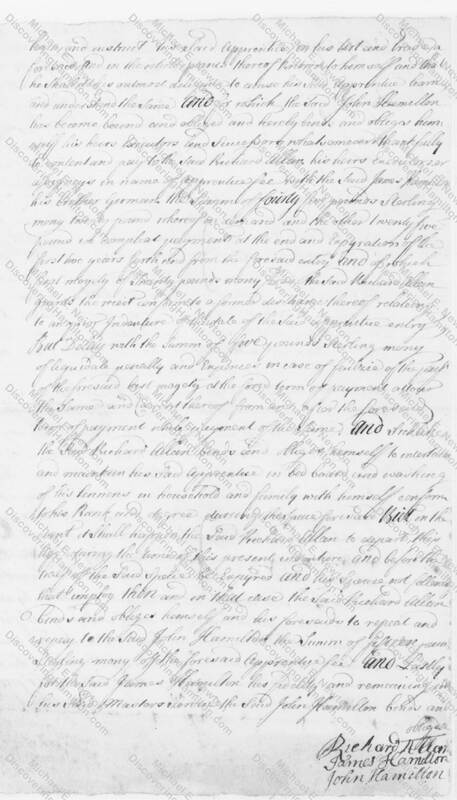 Additionally, now that the Library of Congress has made the Alexander Hamilton Papers available online, I can share with you the original documents that reveal the early business career of Alexander Hamilton’s father. 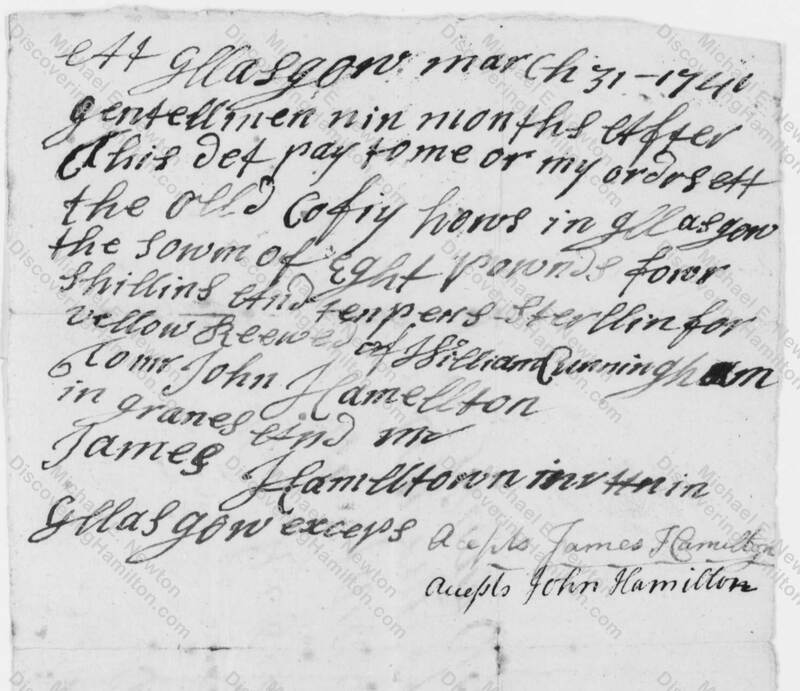 According to an agreement dated November 11, 1737, on “the fifth day of February last,” i.e., February 5, 1737, “with the special advice and consent” of his brother John, James Hamilton entered into a four-year apprenticeship with Richard Allan, the Glasgow businessman who owned the Haarlem Linen and Dye Manufactory. James was to serve as Allan’s “apprentice and servant” while receiving room and board and being taught about manufacturing and commerce. 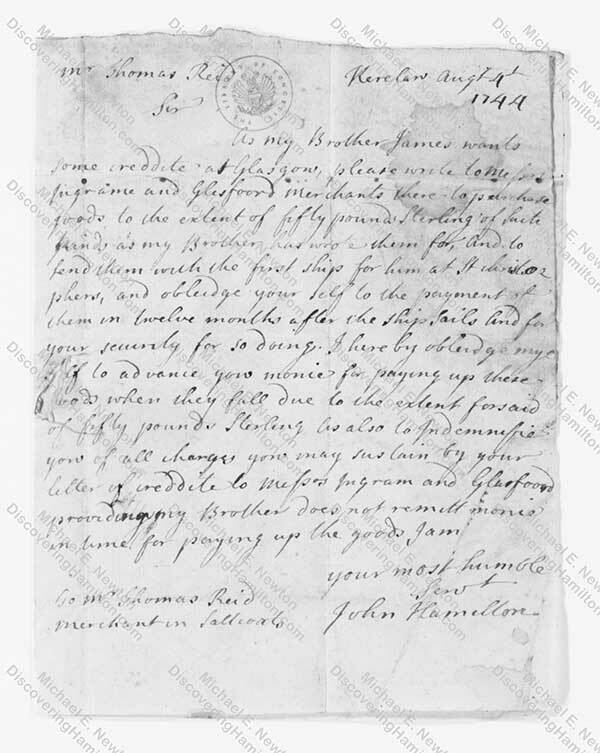 For this education, John Hamilton paid Allan the agreed upon sum of forty-five pounds. * Courtesy of the Library of Congress: https://www.loc.gov/resource/mss24612.029_0621_0640/?sp=2 and https://www.loc.gov/resource/mss24612.029_0621_0640/?sp=3. * Courtesy of the Library of Congress: https://www.loc.gov/resource/mss24612.029_0621_0640/?sp=4. 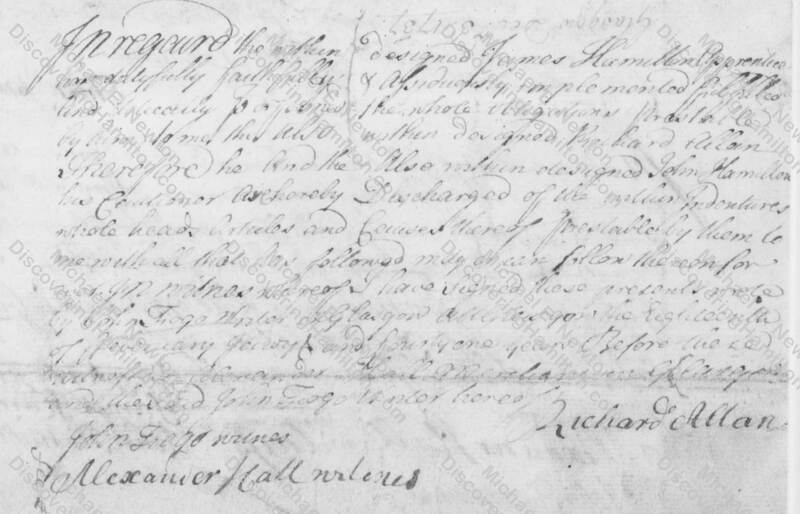 An addendum to the above indenture notes that John Hamilton gave Richard Allan an additional “five Guineas” at the end of the apprenticeship as a “compliment” to Allan’s wife, presumably in gratitude for her taking care of James during his apprenticeship. * Courtesy of the Library of Congress: https://www.loc.gov/resource/mss24612.029_0621_0640/?sp=3. Uninterested in continuing to work in the textile industry in Scotland and noticing Glasgow’s burgeoning trade with the West Indian sugar islands, James Hamilton decided to move to the Caribbean as a merchant. In March and April 1741, still in Glasgow, James Hamilton made numerous purchases on credit, presumably of goods to resell in the West Indies and necessities for his new home. * Courtesy of the Library of Congress: https://www.loc.gov/resource/mss24612.029_0621_0640/?sp=5 https://www.loc.gov/resource/mss24612.029_0621_0640/?sp=6 https://www.loc.gov/resource/mss24612.029_0621_0640/?sp=9. Soon afterwards, James Hamilton departed Scotland and sailed to the British-controlled West Indian island of St. Kitts. 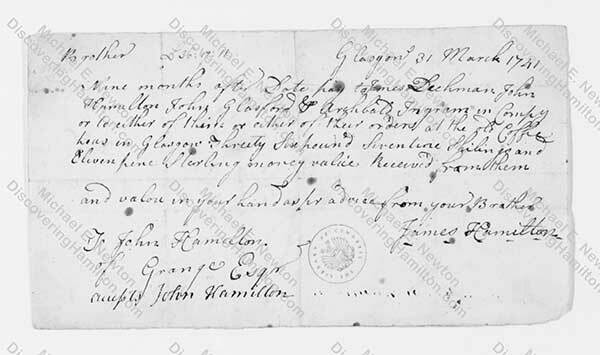 In August 1744, James Hamilton was still operating as a merchant on St. Kitts and had his brother John “purchase goods” on credit in Glasgow “to the extent of fifty pounds Sterling,” with John acting as guarantor for the debt. * Courtesy of the Library of Congress: https://www.loc.gov/resource/mss24612.029_0621_0640/?sp=11. 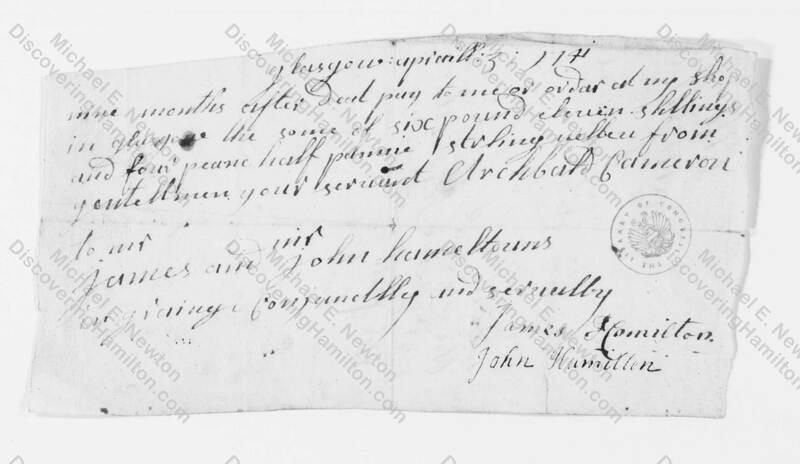 Sometime in the next four years, James Hamilton either abandoned his mercantile business or required additional income to make ends meet. In July 1748, he took a job as a watchman or weighman at the port of Basseterre, St. Kitts. I think the only way will be for you to write a letter to my brother acquainting him that the Gentlemen from whom he had his goods wanted payment. I would not have given you this trouble but my brother does not know I am engaged for him. Likewise, I desired the favour you’ll write to the Gentlemen at Glasgow that you had wrote to my brother, hoping they would have patience till you had an answer. The last letter his mother had from him was some time ago where he writes he had bills but at that time they were not due. * Courtesy of the Library of Congress: https://www.loc.gov/resource/mss24612.029_0621_0640/?sp=13. © Please cite this blog post and/or the original sources at the Library of Congress when incorporating the above information in your writings. Ron Chernow wrote, “In November 1737, John Hamilton took the affable but feckless James, then nineteen, and steered him into a four-year apprenticeship with an innovative Glasgow businessman named Richard Allan.” Although the agreement between John Hamilton and Richard Allan was dated November 1737, the agreement states that the apprenticeship began nine months earlier in February 1737. Alexander Hamilton to Robert Troup, July 25, 1795, in PAH 18:505; Alexander Hamilton, addressed to William Jackson but sent to James McHenry, August 26, 1800, in ibid. 25:89. 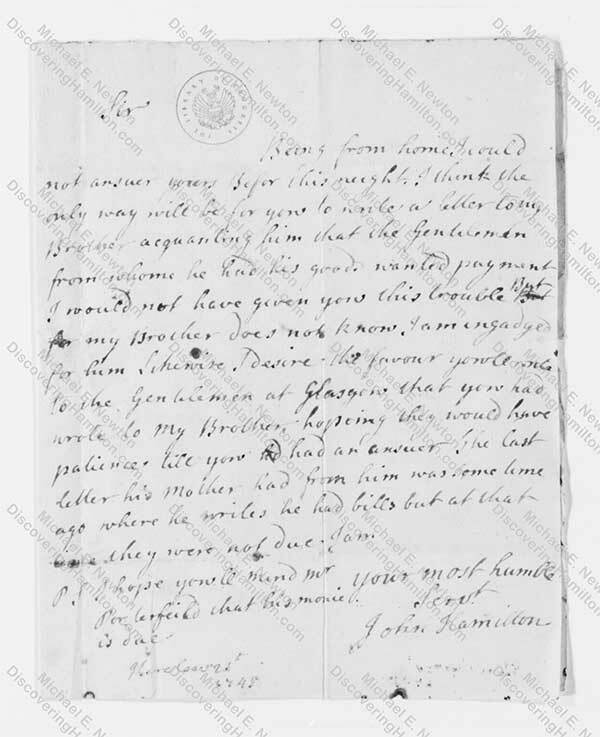 Alexander Hamilton, addressed to William Jackson but sent to James McHenry, August 26, 1800, in PAH 25:89. The letter at the bottom reads “Kerelaw 21t 1748” or “1749.” No month is given and it is unclear whether the year is 1748 or 1749. 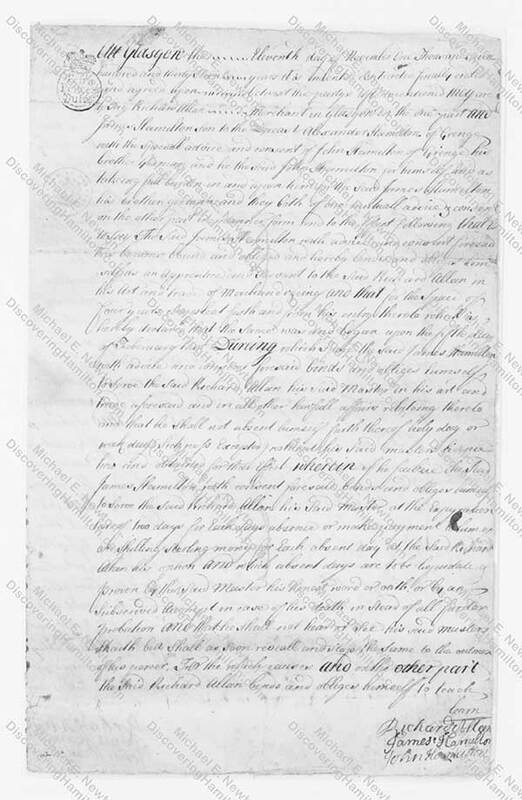 Alexander Hamilton to Robert Troup, July 25, 1795, in PAH 18:505; Alexander Hamilton to William Hamilton, May 2, 1797, in ibid. 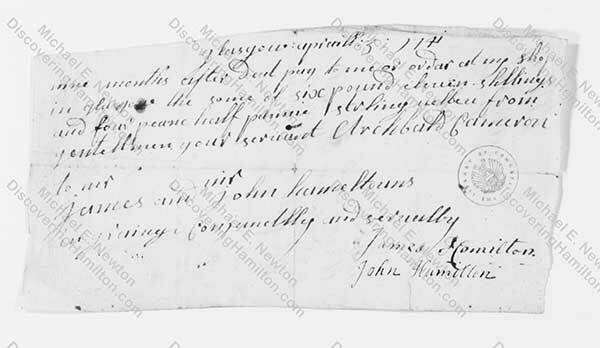 21:77; Alexander Hamilton, addressed to William Jackson but sent to James McHenry, August 26, 1800, in ibid. 25:89. 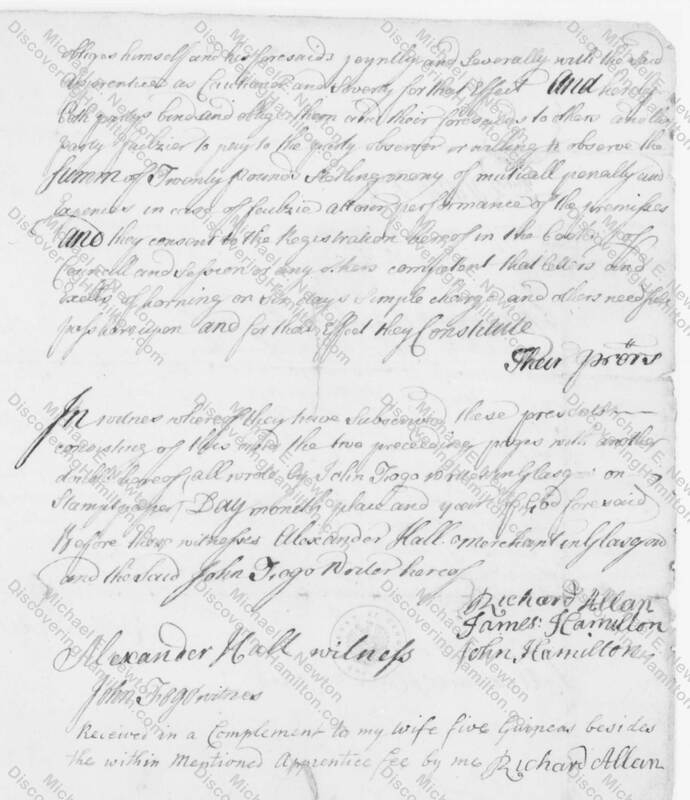 Did James McHenry Attend Alexander Hamilton’s Wedding? Well done and highly interesting. How does rge livrary of congress come by these documents? At the time of their creation and subsequently where were they kept and in whose pocession? 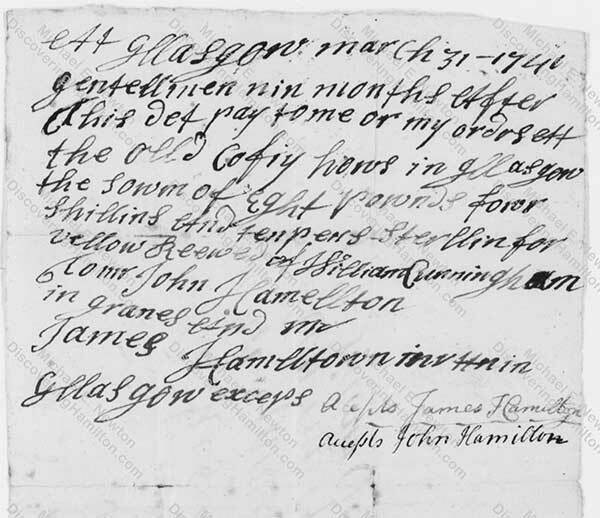 This is extremely interesting to me especially the reference to Kerelaw of 1748The Hamiltons continued to live there although they had changed the name to Grange.In about 1789 it was sold to Gavin Fullarton a West Indies merchant who restored the old name.Alexander was the great grandson of John Hamilton who bought Kerelaw from the Cunninghams in 1685. Thank you Isabel for bringing up the topic of Kerelaw. It’s not clear that the Hamiltons changed the name from Kerelaw to Grange. The above letter suggests that they maintained the name of Kerelaw. Gavin Fullarton belonged to an old Ayrshire family and was born in Scotland. He moved to the West Indies, whether as a merchant as you say I’m not sure, but he owned a large estate in Demarara (Guyana). He moved back to Ayrshire and bought Kerelaw.